For Owners, managers and investors are carefully watching the spring apartment lease-up. Retaining good tenants is now a top priority for every complex. Especially interesting are the properties with low vacancy at market rents, and how managers are achieving that in the current rental market. Very well located properties seem to hold occupancy consistently, even in a downturn, and senior units typically have a stable profile with increasing demand despite recent increases in supply. Another category of units able to attract and hold tenants are properties near UNR, whose total student enrollment now tops 20,000. Owners of properties under twenty units quickly move rents down to fill vacancies. But rising, double-digit vacancy now affects 70% of market-rate properties over 50 units (and 55% of market-rate properties over 80 units) as managers re-set rents and concessions to attract and retain qualified tenants. Tenants with stable employment have choices and they know it. So who else does well in a downturn ? Often overlooked in a soft market is the economic strength and stability of the true rental community, defined as an apartment complex in which most of the tenants emotionally identify with their apartment community as a whole, not merely the single unit they live in. Investors say they can spot such properties when they find a resident manager who knows the residents by first name, where residents congregate on the property and where residents respect and look out for one another. Tenant spaces opening onto common area reflect an unusual pride of place. Residents of the true rental community see their apartment home as unique, they often stay for years and recommend the property to friends, co-workers and family. For landlords, a true rental community is an operating gem. Turnover can decline 50% and retention rates are the highest among comparable properties. Promotional costs are reduced as residents refer new residents to fill vacant units. In good times, a waiting list is common. The owner can easily implement pro-active unit maintenance that’s welcomed by residents. Common areas typically need much less maintenance, as residents see their home as a safe and caring place, so problems are corrected quickly in a virtuous cycle of property improvement. Loss to lease expense is almost non-existent, and insuring these properties is cost effective because liability claims are few and small. The true rental community delivers stable, consistent net revenue and operating costs with few surprises. Shrewd owners will visibly improve the property continuously, and so keep rents slightly above neighboring properties because the comparative value to the tenant is an emotional intangible beyond price. Owners of the true rental community often act as owner-managers to systematically improve their property, especially its curb appeal, amenities, security and cleanliness. Their resident managers are usually long-term employees who know the property well, select residents skillfully and are superb at really listening to tenants. Quick to act on good ideas, these managers are highly creative in promoting the community. They build good will among the residents by being positive, friendly and reliable. Both owners and managers of the true rental community excel in attracting staff for maintenance, leasing and grounds who exhibit the personality traits that residents deeply appreciate. These communities evolve from a committed owner and long-term manager, through careful resident selection and retention over years, and the result is something you can sense immediately upon entering the property. In a downturn, the true rental community has several advantages. First, the communications between residents and management are open and frequent, so the retention conversation can occur early and comfortably. Tenants who need to double up, downsize, or blend rents to extend renewal don’t spend days getting an answer or make commitments to another property when the tenancy could have been rescued. Rather than drop the rent to meet the market on a vacant unit, the manager can blend the resident’s rate with an incentive to remain. Second, residents of the true rental community tend to be lifestyle renters with stable employment or income sources, not temporary renters in life transitions or young couples forming a first household. Such tenants tend to batten down in tough times, especially when their home is more than just a rental unit. Third, credit issues and revenue loss to lease both decline sharply in a downturn, as residents pare back non-essential spending and make sure priorities like timely rent payments are made as agreed. Fourth, the vendors who service these properties truly value the business, because the owner and manager are loyal to vendors who perform well, and both parties respond frankly to open discussions about costs and value in a downturn. Finally, these properties normally have low debt levels and manageable debt service, so basic capital expenditures and maintenance are not sacrificed to the burden of leverage. Many properties in the Reno/Sparks region are now evolving into true rental communities, and some have long since matured into it, such as Dakota Crest, Vista Ridge and Kirman Garden. One excellent example is Water’s Edge Apartments, at 200 Booth Street, near Reno High School. 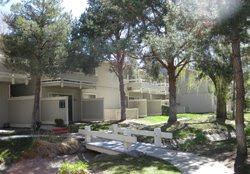 Located in the premier school district of Washoe County, the property has been owner-managed for nearly twenty years. Built in 1977, the property has been continuously upgraded with modernized interiors and a common area that capitalizes on its site adjacent the Truckee River. But what can’t be easily described in facts and figures is an unmistakable quality of resident satisfaction in a true rental community. As long as your property will provide you with positive cash flow on a consistent basis, you won't be rocked by market fluctuations, including rapid depreciation of real estate values.